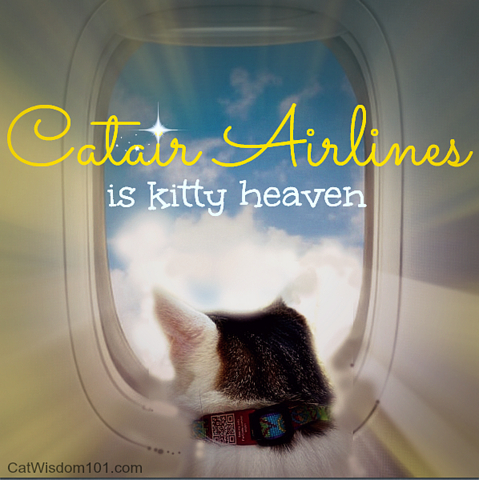 Thirty years ago I learned a valuable lesson flying from Montreal to Toronto, Canada with two cats. On a bitterly cold December morning in 1980, my parents dropped me off at the airport with my two cats snuggled on a blanket in their cozy wicker carrier. I was excited about moving to Toronto and I envisioned a pleasant flight with my cats lounging on my lap with all of us enjoying the view (as in this image). My fantasy flight deflated when I was told the carrier was too big for the cabin and my cats had to fly in cargo, in a crate. “But it’s 20 below zero and I don’t have a crate and my flight’s leaving in twenty minutes”, I wailed. This was before cell phones, the Internet or the wisdom of experience. A surly attendant shoved an unassembled crate for me to assemble on the airport floor while my cats sang a mournful opera. The scene was straight out of comedy skit but the joke, it turned out, was on me. My heart sank when I moved Mergatroyde and Lulu into their cold steel prison. I wasn’t even allowed to place their blanket inside the bare crate. I’ll never forget the abject terror in my cats’ eyes. It was the first time I’d seen that kind of fear with fully dilated pupils and my intuition screamed this is so wrong! I’d fallen in love with cats with my first kitten, Tiger, at age three and felt an immediate ability to think like a cat and respect their nature. The nail-biting flight from hell lasted over an hour but felt like an eternity. Once we landed, I ran to the baggage carousel and waited for my precious cargo. You’d think they would have treated live animals better than luggage but they didn’t. Long after everyone had picked up their luggage I kept my tear-filled eyes glued on the baggage ramp. Finally the metal torture chamber slid down the ramp, with my shivering cats mute from shock. The only visible evidence of their ordeal was a puddle of urine on the cold metal floor. The airline never returned my beautiful wicker carrier. It’s hard to say who was more traumatized but I didn’t fly again with pets until twenty years later when I moved to New York a few weeks before 9/11. I vowed to never inflict unnecessary stress on any cat ever again. On the second flight with cats I left nothing to chance or thought I had. I bought another passenger seat to comply with the one cat per passenger rule and double-checked the measurements of the carriers, but realized to my horror, once on board, the hard-sided carriers didn’t fit under the seats. Luckily the kind flight attendant overlooked the discrepancy and Merlin and Coco serenaded the other passengers with non-stop Siamese singing. It wasn’t as relaxing as this image suggests. Tip: offer to buy irate passengers drinks. When we know better, we do better. The following is what I wish I’d known 30 years ago. Travel is stressful on humans and pets. Being prepared in advance lessens stress. Prepping 30 days in advance is ideal. Assess risk before considering flying with a vet visit. Pets that are ill, injured, pregnant, elderly or very young are at greater risk. Snub-nosed dogs like pugs or cats like Persian and Himalayans are restricted from flying in cargo. You will need to visit a vet anyway to obtain health and rabies vaccine certificates. Do your homework. All airlines have individual policies regarding air travel. Check this airline index of pet policies. Please call the airline at the time of booking and inquire of any updated policies. Book a direct flight if possible. Double-check pet carrier size regulations. Be sure the pet is able to stand up and turn around. My preference is for a soft-sided carrier with air vents/ mesh windows on top and sides. Purchase the carrier in advance and allow the pet to explore it leisure with the door(s) open. Place a familiar smelling item i.e. a small catnip toy, a t-shirt smelling of the pet parent inside the carrier. Place a small pee pad on the floor. Spray Feliway or another “feel good” synthetic pheromone inside carrier. Prior to the flight spray again. Attach your pet’s name, your cell phone #, destination address and small photo of the pet on the carrier. Stick a “Live Animals” stickers on the carrier. Check that all zippers, door hinges and locking mechanism are functioning. Vets usually don’t advise medicating pets but homeopathic remedies or flower essences like Rescue Remedy are safe and work for both humans and pets. Reiki, the subtle energy healing modality I practice works well and is calming for humans and pets even from a distance. Attach a collar with ID even if the pet is micro-chipped. IDs with a QR code like those from FurCodes can be scanned with a smart phone. It’s advised that pets who don’t normally wear a collar or ID do so. Pets regularly escape from carriers enroute. 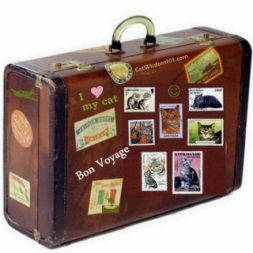 Keep all travel documents/certificates handy including a photo of the pet. Fortunately most of us have tons of pet photos on our digital devices! Remember to pack any pet meds, wet wipes, brush and treats. Water bowls tip over so pack an eyedropper to squirt a little water in the side of you pet’s mouth if needed during the flight. For travel inside the cabin, the general rule is one pet per airline seat. The pets must remain in their carrier and under the seat for the entire flight. I strongly recommend not flying pets in cargo unless there is no other option. Avoid flying during the hottest or coldest times of the year. Just because cargo is heated or air-conditioned, the tarmac is not. Intuitive animal communication. This is worth a try even for those who don’t believe in telepathy. Whether you’re flying with the pet or not, communicate verbally or nonverbally with the pet before and during the flight. Begin with grounding yourself with slow deep breaths, visualizing a peaceful place, or by praying or meditating. Once calm and centered, connect with the pet by calling their name, if you can see their face, blink slowly until they slow blink back. If not visible, visualize their face (a photo helps); tell them you love them. Feel a love energy going directly from your heart to theirs. I like to imagine a big pink cloud surrounding them with love and peace. Imagine and relay images of them being in the carrier, moving through the airport, being on a noisy thing called an airplane. Tell them they will traveling X amount of hours, they will be safe and going to X (describe the destination). Promise treats, their favorite toys and whatever else they love. As travel progresses, give updates i.e. Hang on, we’re almost there. Keep your thoughts positive, calm and loving. Reassure them that everything will be okay and you will be together soon. Any stress from you will be picked by the pet and add to theirs, so stay calm in order to fly the friendly skies without fur flying. Bon voyage! Layla Morgan Wilde is the writer, photographer and holistic cat behaviorist behind Cat Wisdom 101. Head over to read more about her cats and their lives.